This piece was published in The Big Issue in April 2011. Sean Stanley Had JUst Turned 18-years-old when he started sleeping in his beat-up Peugeot 106. The little car became home to Sean and his girlfriend Georgina for almost nine months as the Bournemouth teenagers survived on their wits and crammed everything they owned into a few plastic bags. Sick of being disturbed by drunks and police telling them to move on, the couple spent a few months driving around the north of England in search of somewhere quiet to park each night. “We were all right. It felt safe enough with the windows up and doors locked,” says Sean (pictured above). Sean’s mum was an alcoholic. She moved away and left him alone in Bournemouth as soon as he finished school (he had done well in class, but wasn’t together enough to sit exams). He just couldn’t stick the hostels and B&Bs in which he was placed by the council. Sean is now 21-years-old. He and Georgina split up last year. And brake problems finally killed off the old Peugeot. But he is beginning to piece together the puzzling jigsaw of adult life. Sean is back in Bournemouth, staying on a friend’s sofa while saving for a rent deposit, and looking into construction courses. Planning for the future is a precarious business for most of us, and it can be particularly daunting for teenagers struggling to find somewhere safe to sleep. No one wants 16 or 17-year-olds to be isolated, but charities and housing agencies are warning the current safety net could soon be “wiped out” by spending cuts. Three years on from a landmark ruling on how homeless 16 and 17-year-olds should be supported, councils across the UK are still failing to recognise the unique vulnerability of teenagers. In 2008, Supreme Court judge Baroness Hale said children’s services departments “cannot avoid their responsibilities towards this group by passing them over to their local housing authorities”. One recent survey showed only 38 per cent of local authorities were assessing the needs of teenagers appropriately, meaning a huge majority of them continue to be lumped in with adults on over-stretched housing waiting lists. Some housing officers have shown themselves capable of finding teenagers the right kind of support. In Falkirk, hundreds have been helped into adulthood at Ypeople’s supported accommodation centre. Here, sympathetic staff are on hand to advise on the bewildering world of benefits and job training. Young residents describe the relief of finding a place that feels like home after spending weeks in “grotty” B&Bs. Martyn Mackintosh was kicked out of the family home at 16 after terrible fights with his step-dad. He describes the frustration of staying with pals and being moved around hostels for two years. Now 20, Martyn believes the past year at Ypeople’s Seaforth House has helped him quit drinking and start applying for jobs. He hopes to move into his own flat this month. Even in tough circumstances, aspirations can remain resolutely high. Caragh Spencer-Hicks (below) was made homeless at 16 when she fell out with her parents. 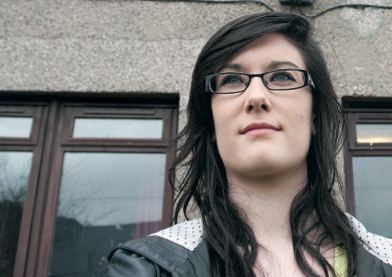 But since finding a place at Seaforth House, Caragh has thrived at the local secondary school. She gained two Higher qualifications last year and is sitting four more next month. She had hoped to go to university to study nursing, but benefit rules mean she would lose her housing allowance – which she depends on to remain at Seaforth House – if she embarks on higher education. Under-19s are only entitled to housing benefit if at school or studying part-time. The National Union of Students calls the housing benefit rules “outrageous but unsurprising”. Una Barry, deputy chief executive at Depaul UK, says money is still the biggest worry. Charities are struggling to cope with severe cuts to the Supporting People grants given by Westminster to local authorities to house the most vulnerable. Some of Depaul’s projects in England have been slashed by 30 per cent. Homeless Link has estimated the cuts will lead to a 16 per cent reduction in emergency bed space across the country. “A lot of time and effort has been put in to trying to better accommodation, but that progress is in jeopardy,” says Barrett. “There’s no getting away from the fact cuts mean less support for young people. “It means reverting to greater use of B&Bs, or sticking young people in inappropriate accommodation where they’re sharing with adults – perhaps people out of prison, perhaps with people you wouldn’t consider safe for your own son or daughter,” she adds. Does the Media Make You Ill?